The Belrose is a gorgeous, contemporary gastro-pub on Haverstock Hill, situated between Chalk Farm and Belsize Park. It is stylish inside, with dark woods, royal blues and plenty of plants, book shelves and frames donning the walls. This, and the fantastic service, gives the place a sophisticated feel – even with the football showing. It was lovely to see them welcome dogs in too, which gave us endless ‘oohhs’ and ‘awws’ as we watched them trot in. This lovely pub in Belsize Park has an extensive drinks menu, as you might expect! There are 9 draught beers, including their own pale ale, numerous bottles of beer and cider, and a good handful of options for each type of wine (red, white, rose and sparkling). 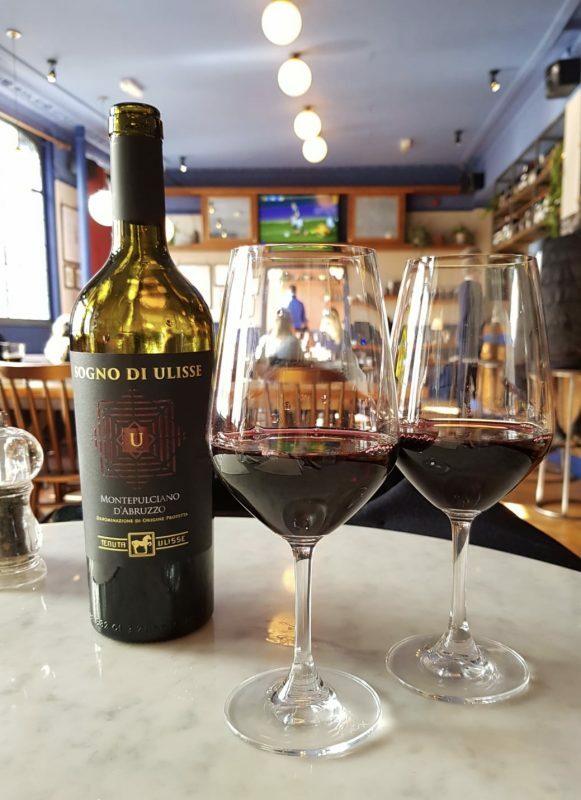 In the mood for a glass (or two) of red, the Sogno Di Ulisse Montepulciano d’Abruzzo 2015 (£34 for a bottle) was recommended to us. It was smooth and beautiful in flavour, not too full-bodied. It went really well with each course, and obviously the beef roast in particular. 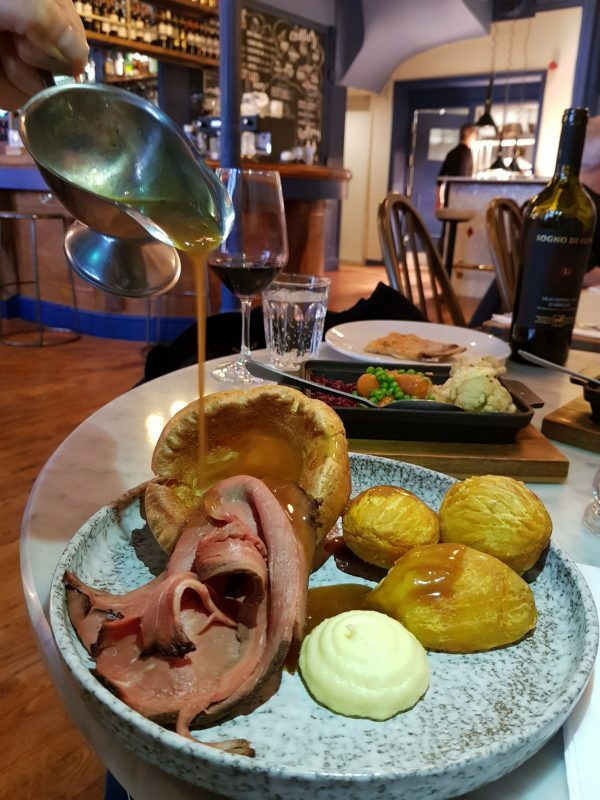 The Belrose has a small Sunday lunch menu consisting of three options; Roast Rib Eye of Beef, Roast Chicken Breast or Nut Roast (all £18 which is slightly on the higher end). 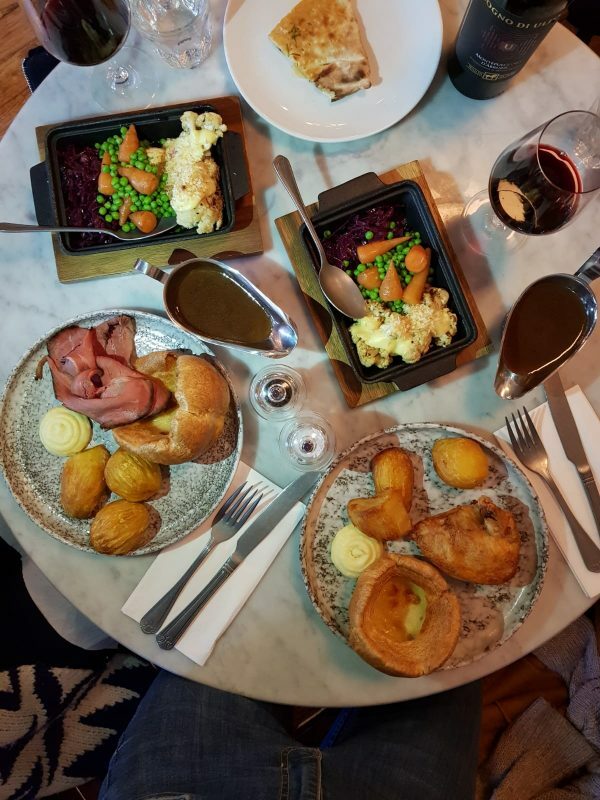 They are all served with roast potatoes, yorkshire pudding, herbed breaded cauliflower cheese skillet, braised red cabbage, chantenay carrots, peas, horseradish cream, a white onion cream and endless gravy. 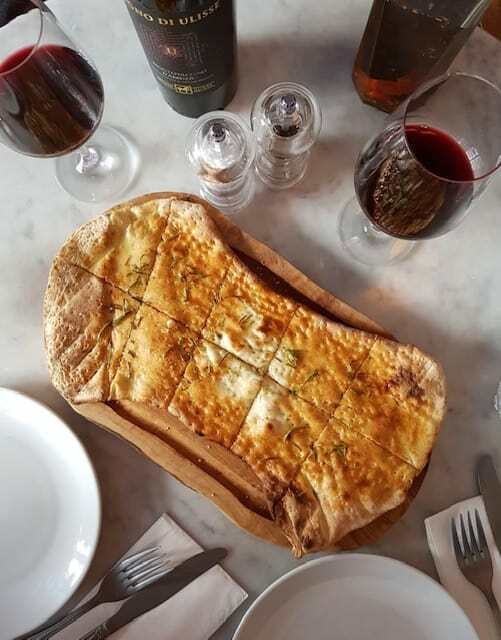 This sits alongside the main menu on a Sunday, which features a handful of sharing plates and mains as well as pizza – so you can mix and match if you prefer. We started with the Rosemary and Garlic Pizette (£5). A great appetizer to enjoy whilst sipping on red awaiting our roasts. It was thin and crispy with plenty of fresh rosemary, and was delicious as it is, or even more so with a little chilli oil. The roasts arrived and filled the table – one roast chicken breast and one roast rib eye of beef. The chicken was a little dry inside, although we did enjoy the crispy finish. The beef on the other hand was fantastic, really tasty. The potatoes were super crispy on the outside, fluffy in the middle, and the huge Yorkshire pudding was superb too! The cauliflower cheese didn’t really impress, with minimal breaded topping and not much cheese drizzled over the top either. However, the other a la dente veggies were great. It was nice to have the mild puree alongside this too, as well as as much gravy as we wanted. You must however save space for dessert. If you’re dining at The Belrose, you HAVE to go hungry.. because the Nutella Calzone (£6) is incredible. 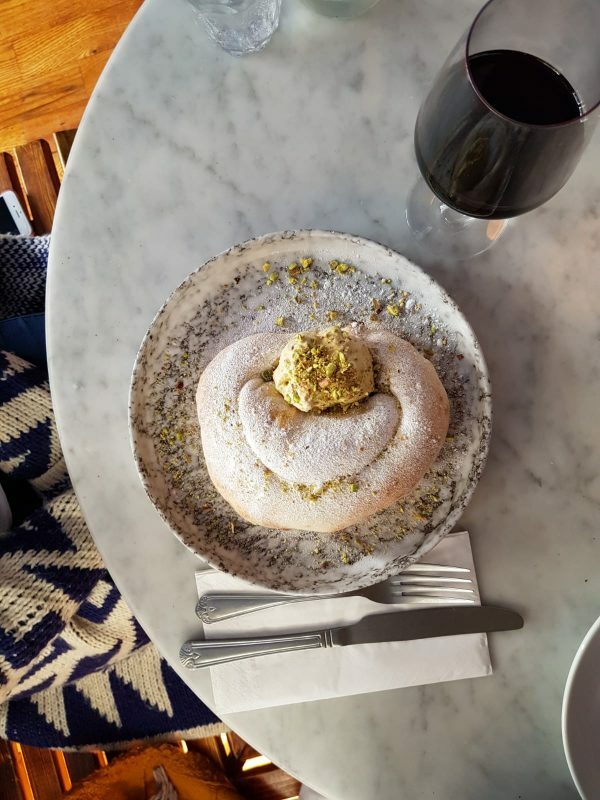 It was a heavenly folded soft sweet pizza dough, filled with warm, oozing Nutella, and topped with a scoop of creamy pistachio ice cream and crumbled pistachios. There was plenty of Nutella, the crumbled nuts added a delicious crunch and the flavour of the pistachio shone through from the ice cream too. One super delicious dessert! The Belrose is a fantastic, gorgeous pub in Belsize Park. It has a relaxed and sophisticated feel, and great service from all of the team. A varied range of choice for drinks (the red wine was superb), a good roast (on the top end for what we’d pay for it), and an incredible dessert calzone. Lovely place to spend a relaxing Sunday – perhaps after a stroll over Primrose Hill.